Korean Air has expanded its network to the Middle East with the announcement that a direct service between South Korea and the Kingdom of Saudi Arabia, the largest Arab state in Western Asia, will begin on 9 November 2012. 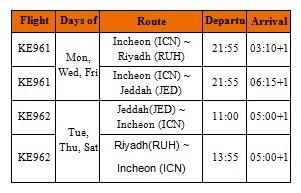 Korean Air will commence the direct service three times a week, flying from Seoul/Incheon first to Riyadh and then onto Jeddah. The Seoul/Incheon – Riyadh – Jeddah route will be operated with an Airbus 330-200, seating 218 passengers and equipped with Korean Air’s premium seats. First Class has 6 Kosmo suites; the 180-degree full-flat beds have been widened by 15cm (6 inch) to 67.3 cm (26.5 inch) to provide passengers with added comfort. The Business Class, called Prestige Class, has 24 full-flat sleepers with 188cm (74 inches) between seats and extra large seat partitions offering comfort and privacy. Passengers in all classes can enjoy the new AVOD system that offers upgraded in-flight entertainment in high resolution and with top processing speed. 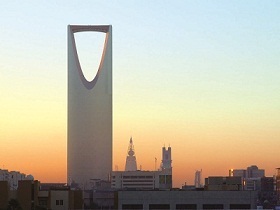 Historically, Saudi Arabia and Korea have had commercial connections. In the 1970s and 1980s, the time known as the ‘Middle East Boom’ years, Korean companies won many valuable construction contracts, contributing greatly to Korea’s economic progress. In order to facilitate travel between the nations, Korean Air operated flights to Jeddah and Dhahran, the biggest markets in the region at that time. The demand for plant construction in Saudia Arabia has once more increased and again Korean construction companies are part of the new ‘Boom’ with Korean Air expecting the demand for passenger traffic in the region to increase with high growth potential. With its new Seoul/Incheon-Riyadh and Jeddah service, Korean Air aims to attract business travelers visiting Saudi Arabia and will develop the market, which has a great potential for growth. The service will also be of interest to transit passengers from neighbouring countries to Korea, including Japan and China, who will travel to Saudia Arabia via Korean Air’s hub in Seoul, the award winning Incheon International Airport.